Whether you’re newly diagnosed with HIV, taking PrEP, or trying some new supplements for your trainer’s bulk-up regiment, it can be difficult AF for a newly medicated person to remember to take medications if you’re not used to taking medications each day. 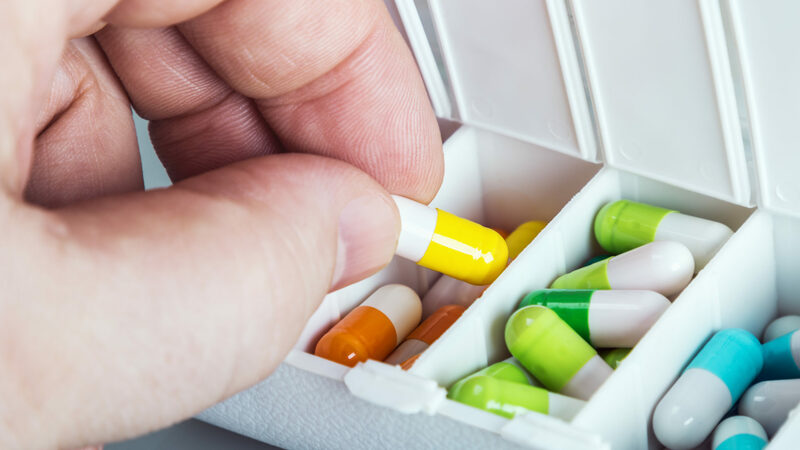 Do you remember that last case of strep throat you had, or ear infection, or other ailment when you had 10 days of antibiotics and your provider told you to “make sure to take all of the medication”? And then 12 days pass and you realize you still have some pills left? You’re not alone, and it’s unlikely the pharmacist miscounted. The things going on in your life, what your priorities are, and how busy you are can all affect how well you remember to take medications – especially if you haven’t taken medications regularly before. Both HIV medications and PrEP need to be taken daily to be effective. If you’re starting up a new medication routine, a pill box may provide the training wheels you need to be accountable for taking the meds. Pill boxes can be picked-up relatively inexpensive from any local pharmacy. At the time this was written, we were able to find this RipplePHX-Blue Pill Box from local Walgreens stores in-stock for just over $4. They also come in morning/evening styles, and multi-times-a-day styles. Whether you’re taking multiple pills or just one pill a day, a pill box helps you establish your routine and helps you answer the question of “did I remember to take my pill(s) today?”. You’ll be able to see any days you’ve missed each week, and allow you adjust your routine based on how well you’re doing each week. If you’re still having trouble, you can add medication reminder apps on your phone, or change the location of where you store your medications so they’ll be in a place you’ll see them each day. But for someone new to taking medications, a pill box is still one of our favorite, affordable training-wheel tools!